When a group of friends go paintballing in the wilderness they come across what they think is an abandoned building. Inside this derelict building is a scientist who is trying to find a way of stopping a biological weapon from destroying everything. According to the scientist if nothing can stop the growth of this bacterial mutation the world will end in less then 48 hours. As the contagion begins to devour anything living in its path it begins to multiply and gets bigger. Of course the military get involved and threaten to use a nuke but talks turn to even drastic measures. There is only one way to stop this bacterial monster and that is using a man made black hole, but this also has the potential of destroying the entire Earth. This is the film debut of Alison Whitney (MUCKMAN) and she plays one of the main female leads competently alongside some other actors who would appear in other Brett Piper films over the years. I don't think the sfx are as good as I would normally expect by Piper but they do the job especially the blob like creature grabbing a helicopter. 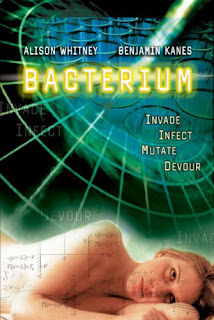 BACTERIUM is basically a homage to the film THE BLOB with a biker gang, less serious acting and an even lower budget but the main thing is it entertains.